Research and creative processes bring things into the world imperfectly. That is the syntax of making. What kinds of perspectives might we adopt toward the institutional integration of art and research? In conversation with U.S. poet and scholar Joan Retallack, artist and composer John Cage stated: “When I find myself in the position of someone who would change something—at that point I don’t change it. I change myself. It’s for that reason I have said that instead of self-expression, I’m involved in self-alteration” (original emphasis). In exploring hybrid inquiries among scholars and artists, it has seemed particularly important to work with those who are open to alterations at the level of practice. Consequently, or perhaps through accretion, such practices might incite transformation at the level of the institution. In fall 2017, the Integrated Arts Research Initiative supported by the Andrew W. Mellon Foundation at the Spencer Museum of Art (University of Kansas) launched an inquiry into soils and ecologies, broadly conceived, called Terra Anima, which was a cloud of conversations with an exhibition component. 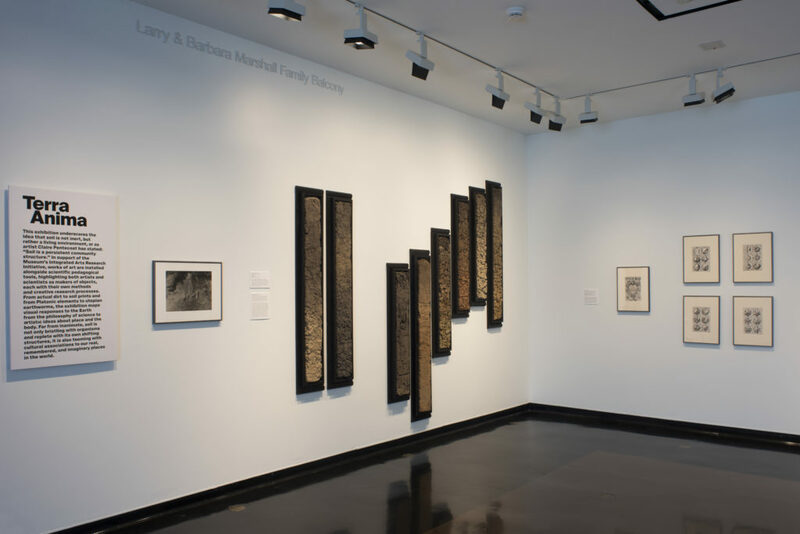 The dialogues among geographers, anthropologists, and artists worked in conjunction with the exhibition component to formulate possible connections. As curator for research, I aimed to hold a space open among the messiness of transdisciplinary exchanges in which new connections and methods for making and thinking through could happen. In curating objects, people, and discourses around a central subject, the work of a curator for research may be to hold back expectations as long as possible without a predetermined goal in mind. In this way, if something might surface, it will have that possibility. Responses to disciplinary and other restrictions are often what drives work, but curating for research seeks to diminish the dominance of any one particular formal or methodological assumption within a hybrid, collaborative inquiry. The programmatic structure of Terra Anima was intentional in its effort to vary formats in ways that created space for a broad spectrum of research and knowing. Each creative/scholar contributed her own work and thoughts in different modes. These included a traditional lecture, gallery talks, walking tours of prairie and wetlands, and some bread breaking to establish collegial relationships. Each participant attended all presentations, so they were legibly connected to a shared, ongoing investigation. The week-long inquiry culminated in a public, roundtable discussion. Although the roundtable was democratic and dialogic in relation to more traditional presentational formats, like all other methods, it enables some forms of access over others. While the exhibition was not privileged over other forms of curatorial work, visual and object-based methods did offer another register on which to engage the collaborative inquiry. Geographer Daniel Hirmas and his team contributed soil monoliths to the exhibition. Soil monoliths are cross sections of earth that preserve the soil horizons and are used to teach the formation and form of soils. To one side of the monoliths was a series of Renaissance prints that imaged the structure of soil envisioned as Platonic solids and illustrated a deep interest in single point perspective, thus emphasizing their dimensionality. Unaccustomed to juxtaposing the monoliths with other objects in new contexts outside of the lab, Hirmas at first characterized the associations as uncanny. That is to say, the prints seemed to be from a different class of objects and from a historical period that pre-dated evidence of soil structure, yet they were clearly invested in the same central questions. Observation in the form of x-ray diffraction eventually gave mechanical evidence of soil structure, though early philosophical and artistic treatments of soil continue to contribute to knowledge about it. Knowledge production is not static. The tensions between contemporary and historically embedded knowledges constitute a dynamic field on which claims may be formulated and worldviews reconfigured. The juxtaposition of objects can catalyze, further articulate, and also problematize arguments and ideas. A grouping of soil chromatograms by artist Claire Pentecost faced the monoliths from across the gallery. 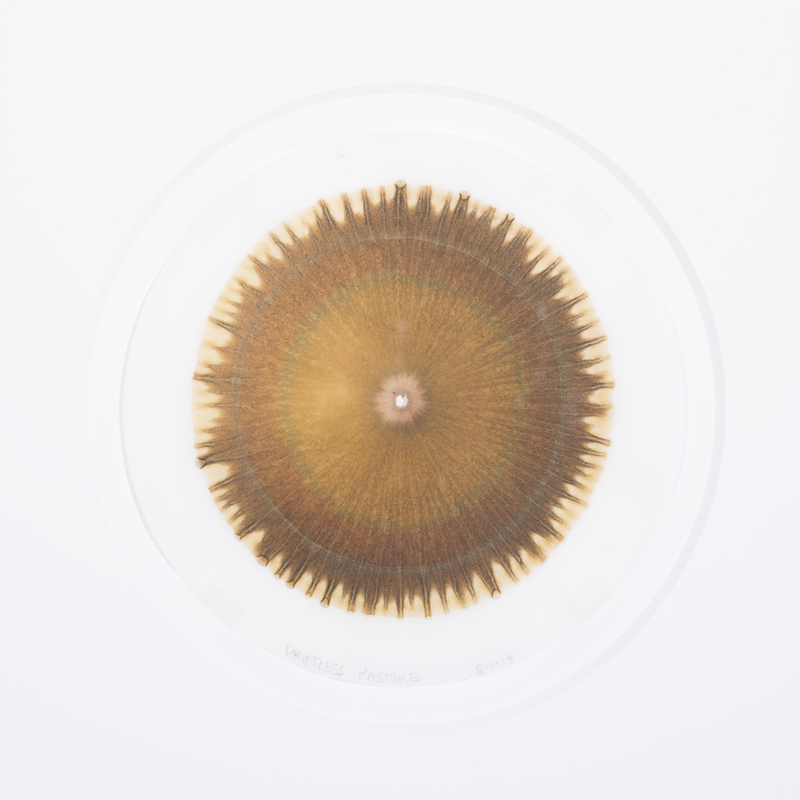 This work uses a chemical process to separate the component parts of soil samples and, through the use of silver nitrate and exposure to diffuse light, creates a photographic image on filter paper that can give indications about such things as nitrogen levels and the presence of organic material. The fact that these works of art do not achieve the degree of exactitude as laboratory equipment is one of the work’s salient points. Most people do not have access to such equipment. Pentecost claims the “public amateur” as a possible position for an artist. She describes her process as beginning with “I don’t know,” and then learning publicly as a form of art making. In this way, Pentecost not only explores the world, but simultaneously offers up the process of knowledge production itself for public scrutiny. Her work often teases out ethical and political implications in methods and distributions of knowledge. The map by Soren Larsen, a geographer who, in the end, spoke back to the museum through a visual work, in many ways returned the inquiry to its institutional ground, so to speak. 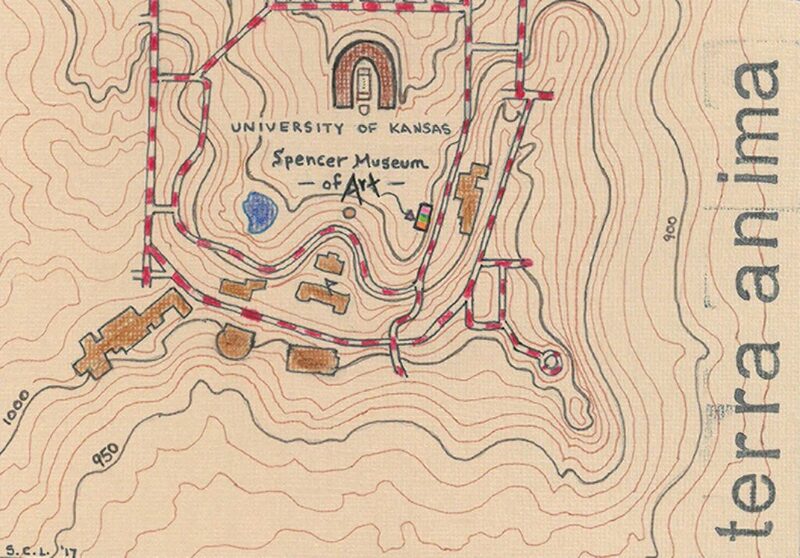 His practice visually and conceptually imaged the site of the Spencer Museum of Art as existing in a network with the research university that is enabled by place. The topographical lines reveal the influence of human and nonhuman forces over time, and the Terra Anima inquiry certainly touched on some of this, traversing prairie and hills to wetlands, and from U.S. research to Indian Nations universities. But some artistic propositions may actually be knowledges whose epistemic virtues have yet to be articulated. Working in a cloud of activities, including exhibitions, dialogues, walks, and meals, the curator for research tries to expand the surface area of engagement to increase the possibilities for multiple, undisciplined contact with the inquiry. This contact then harbors the potential to change the curator, contributors, and the institution. As Cage suggests: we might alter ourselves. John Cage and Joan Retallack. Musicage: Cage Muses on Words, Art, Music (Hanover, New Hampshire: Wesleyan University Press, 1996), 139. Although I do not follow terms like “expert” and “novelty,” which for me harbor nostalgia for the artist-genius and modernist conceptions of the new, Esa Kirkkopelto makes a compelling case for aspace of (re-)institution. “Artistic Research As Institutional Practice” in Artistic Research-Yearbook 2015: From Arts College To University, ed. Torbjőrn Lind (Stockholm: The Swedish Research Council’s Committee for Artistic Research, 2015), 49-53. This brings to mind an early work by queer theorist David Halperin that has always stayed with me. Halperin describes queerness thus: “Queer politics may, by now, have outlived its political usefulness, but if its efficacy and its productive political life can indeed still be renewed and extended, the first step in this procedure will be to try and preserve the function of queer identity asan empty placeholder for an identity that is still in progress and has as yet to be fully realized, to conceptualize queer identity as an identity in a state of becoming rather than as the referent for an actually existing form of life” (my emphasis). David Halperin, Saint Foucault: Towards a Gay Hagiography (New York and Oxford: Oxford University Press, 1995), 112-113. I am thinking here about curatorial research spaces where we attempt to hold space open for emergence instead of mounting exhibitions that present only findings or arguments that are already resolved. Henk Slager references curator Maria Lind who distinguishes between “curating” and “the curatorial,” mirroring the logic behind Chantal Mouffe’s distinction between “politics” and “the political.” “Curating,” then, refers to the business of selecting and installing works of art, whereas “the curatorial” references the work of drawing connections among people, objects, and ideas. Henk Slager, “Academy as Exhibition,” in Curating Research, eds. Paul O’Neill and Mick Wilson (London and Amsterdam: Open Editions/de Appel, 2015), 82. Bringing questions together around a central subject also in many ways references ideas in Boundary Objects and Beyond: Working with Leigh Star. Eds. Geoffrey C. Bowker, Stefan Timmermans, Adele E. Clarke, and Ellen Balka (Cambridge, Massachusetts and London, England: The MIT Press, 2015). Daston and Galison suggest that epistemic regimes change over time and are in dynamic relation. Lorraine J. Daston and Peter Galison. Objectivity (Brooklyn, NY: Zone Books, 2010), 19. Claire Pentecost. Artist talk. Spencer Museum of Art, University of Kansas. Thursday, September 28, 2017. See Jay T. Johnson and Soren Larsen. Being Together in Place: Indigenous Coexistence in a More Than Human World (Minneapolis, Minnesota: University of Minnesota Press, 2017). Soren Larsen with Jay T. Johnson. Wetlands tours. Haskell Indian Nations University, September 28, 2017. Adapted from the quotation: “What is a weed? A plant whose virtues have not yet been discovered.” Ralph Waldo Emerson. The Later Lectures of Ralph Waldo Emerson, 1843-1871, Vol 2:1855-1871, eds. Ronald A. Bosco and Joel Myerson (Athens and London: University of Georgia Press, 2005), 321. To the point of curating for research, I discovered this citation through exhibition collateral materials for Big Botany: Conversations with the Plant World curated by Steve Goddard at the Spencer Museum of Art, March 27-July 15, 2018.